The people living in the region around Füssen at the bavarian alps certainly have a special relation with their king. Even though they have long been influenced by a republican system of government, even though most of them carry out the duty of upright citizens by taking part in democratic elections, their loyalty and love for this king is perhaps unique throughout the world. Deep down in their hearts many of them have remained monarchists, but this allegiance to the monarch is focused on a special person. And that is the king who grew up in their Füssen countryside, who spent most of the years of his life here and who built the most regal of his castles here: Neuschwanstein. He is and will always remain their king. He has long been immortal. Ludwig was born in Nymphenburg Palace in Munich on August 25, 1845. The Crown Prince by no means enjoyed a carefree childhood. He and his brother Otto, two years younger, were supposed to become accustomed to the burden of royal duties at an early age. They were not allowed to associate with other children and any contact with their parents was reduced to a minimum. The princes’ teachers were convinced that keeping their parents at a distance would promote their independence. 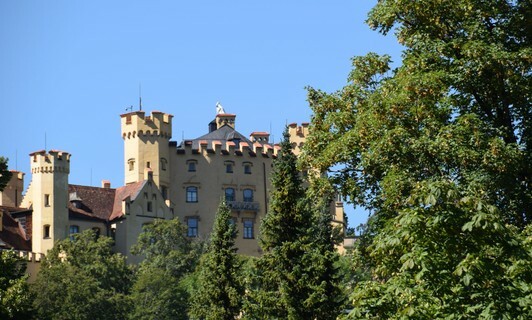 The royal brothers spent much of their childhood away from the capital of Munich at Hohenschwangau Castle. Separated from their parents, brought up by down-to-earth civil servants who kept to the rules and who were mainly intent on making the Crown Princes familiar with the realities of the world, Ludwig lived here, however, in an environment remote from the great affairs of state. A fantastic natural landscape and a castle-like palace, filled with romantic murals depicting German fairy tales, sagas and the omnipresent swan images, were a formative influence on Ludwig, who was of an imaginative and sentimental disposition. Secretly the youthful prince began to occupy himself at night with what interested him most: theater, opera librettos and literature. On February 1861, the 15-year-old prince was deeply moved by his first performance of an opera. Wagner’s Lohengrin was to become for him a key experience. From now on he became one of Richard Wagner’s most ardent admirers and his greatest patron. Still very young – 18 years old – the crown prince ascended the Bavarian throne on March 10, 1864 after his father, King Maximilian II, had died unexpectedly only 53 years old. He could be sure of the support of his subjects: Ludwig, young and attractive, was regarded as the most handsome king and the most popular one with the women of the day. A very close and personal relationship grew up between the King and his cousin, Empress Elisabeth of Austria, called Sissi. They had much in common and were kindred spirits: Ludwig and Sissi liked to behave unconventionally, loved solitude, hated the constraints of the court, were both keen on education and very well read, especially as far as classical literature was concerned. Both were opposed to war and violence, had a very self-assured attitude towards the church and sought sincere friendship with those in whom they could find disinterested support. Neither of them was spared disappointments. In the years that followed, the King, often described by his ministers as being out of touch with reality, withdrew more and more into the fantastic dream-worlds of his palaces in the wild solitude of the mountains. In only two decades on the throne, new and ever bolder plans emerged. Some –for example, Falkenstein Palace – never materialized. 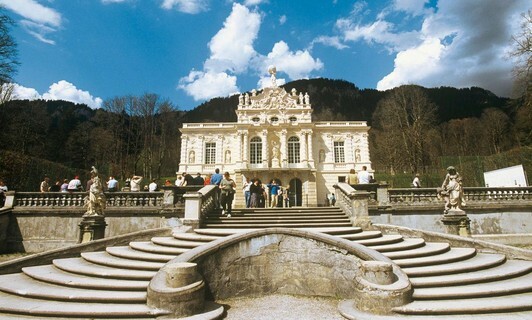 Others were turned into reality and are admired to this day by visitors from all over the world: the rococo Linderhof Palace, built in the French style, Herrenchiemsee Palace inspired by Versailles and, as a climax, the famous fairy-tale castle Neuschwanstein, modeled on the medieval Wartburg. Loved by his people, but hated by his ministers, Ludwig II was declared insane in 1886 and deposed. 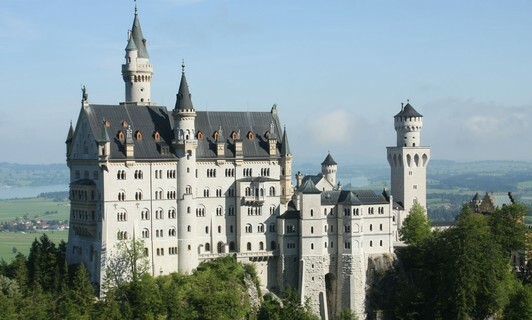 Neuschwanstein would also be his last place of residence before he was taken to Berg Palace on the banks of Lake Starnberg. On June 19, 1886 he mysteriously died in the lake. To this day the circumstances surrounding his death give rise to diverse speculations. Was it an accident while Ludwig was trying to escape, was it suicide or even murder by his political opponents? The records of the secret house archives that could perhaps shed light on the mystery are still closed. Ludwig II experienced Neuschwanstein as a building site enclosed in scaffolding. He never saw it as it presents itself to the eye of the present-day visitor. The construction work was not completed until after his death. The legend of the fairy-tale king lives on, for Bavaria and guests from all parts of the world. The rococo Palace was completed in 1878 and is the only Palace the Bavarian King built and lived in. 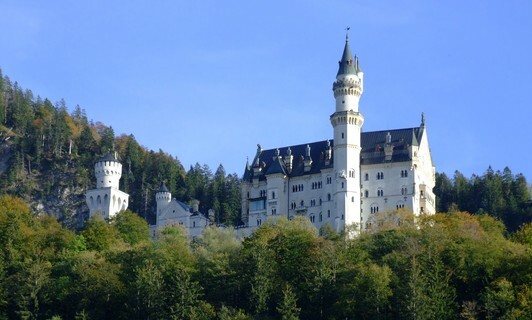 Hohenschwangau Castle is less famous than Neuschwanstein Castle but not less worth seeing.